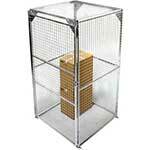 We supply a superb range of secure modular storage enclosures and compounds for both internal and external use. 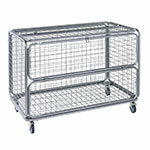 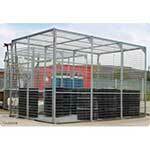 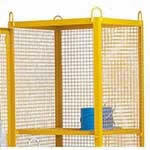 If you need secure metal cages for calor gas cylinder storage, just take a look at our all-steel Welded Mesh Gas Cylinder Storage Cages These cages are not only fully welded from steel angle and 25mm x 25mm weld mesh but they are also fitted with padlock locking facilities and several sizes are available.We also have a fold-away version which folds flat when in not in use. 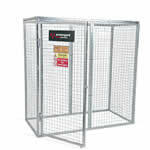 Both our Minibox and Maxibox Secure Mesh Storage Enclosures can be rapidly installed on solid indoor or outdoor surfaces, and come with a mesh roof over and padlockable door. 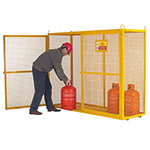 These storage cages are used to securely store many types of items most commonly Calor gas bottles, but they are also useful for storing many other items such as oil drums and general site equipment. 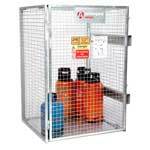 Modular mesh enclosures / compounds for secure internal and external storage - Modular and Folding Gas bottle storage cages - Welded static and mobile mesh cages / security enclosures. 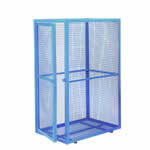 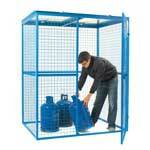 We also supply a range of hand trolleys, stands and racks for storing and moving gas cylinders.